Screen NSW, in partnership with ABC, Screen Australia, AFTRS, & Event Cinemas, today launched Australia’s first virtual reality channel for Australian VR content. 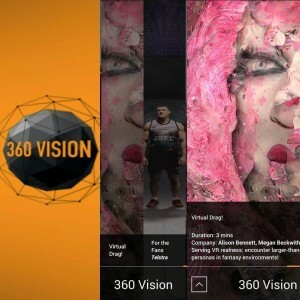 Called ‘360 Vision’, the channel is free online via a smartphone app available via GooglePlay and iTunes. One of the virtual reality films selected for the inaugural showcase by Screen NSW is ‘Virtual Drag’, featuring larger than life encounters with some fabulous drag performers in fantasy environments. Virtual Drag was made by artists Alison Bennett, Megan Beckwith, & Mark Payne. The project was assisted by the Australian Government through the Australia Council for the Arts, its arts funding and advisory body, Deakin Motion.Lab & Media Lab Melbourne. Bennett & Beckwith are both creative arts researchers associated with the Deakin Motion.Lab. ‘Virtual Drag’ features the magnificent Philmah Bocks, the divine Art Simone, Jackie Hammer (a bit of a hot mess really … ), & the knee-weakening Transylvanian Gypsy Kings (aka TGK). t the drag notion of ‘realness’ and the practice of drag gender performance offers fresh perspectives on the cultural production of virtual reality.” Their video lecture on this topic for the UNIT Festival in Berlin was featured in MotherBoard’s report on the festival. The launch of the 360 Vision app is just the first step in Screen NSW’s strategy to support the development of Australian virtual reality content. They have invited leading vr producers and creatives to meet in Sydney for a workshop to support this emerging sector. Virtual Drag was assisted by the Australian Government through the Australia Council for the Arts, its arts funding and advisory body, Deakin Motion.Lab & Media Lab Melbourne.